We love Marlow, right? Well, lots of children and families in Marlow have been painting pretty pictures on rocks and hiding them for others to find – all as part of Marlow Rocks! 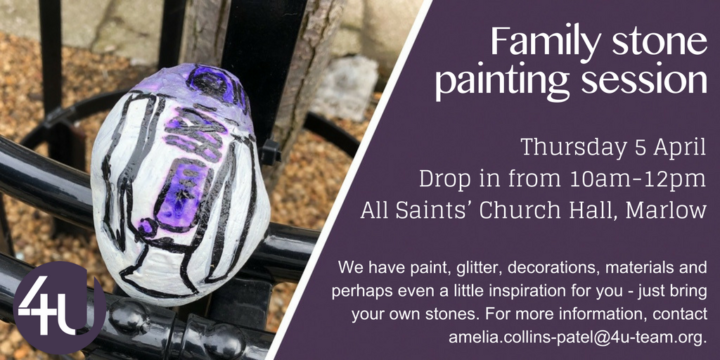 On Thursday 5th April we’re opening-up All Saints’ Church Hall for a drop-in rock painting session so we can enjoy some family time and get creative together. Come along between 10am and 12pm and we’ll have paints, glitter, sharpies and words to inspire you. You’ll need to bring your own stones/rocks with you. We’ll have some but not enough for everyone! For more details, contact Amelia Collins-Patel.